At the start of the millennium, the IUCr launched its first fully electronic journal, Acta Crystallographica Section E: Structure Reports Online, with its founding Main Editors William Clegg (Newcastle, UK) and David Watson (Cambridge, UK). The first issue appeared on January 1, 2001, reporting crystal structure results across a wide range of inorganic, organic and metal-organic materials with access to the complete diffraction data, the submitted CIF and the full checking output. 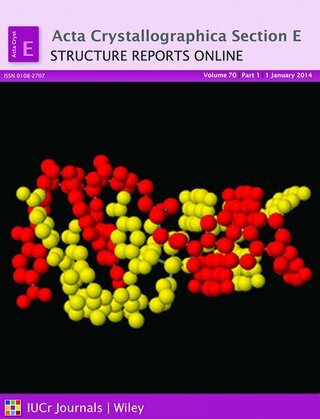 To keep up to date with current trends and demand in the community, from January 2015 Acta Crystallographica E: Structure Reports Online will change its subtitle to Crystallographic Communications. The journal remains fully open access. Acta Crystallographica Section E: Crystallographic Communications will publish two article types: longer format Research Communications and short Data Reports, similar in format to the current articles in Acta E you are already familiar with. Both of these will report crystal structure results across a wide range of materials, with a clear obligation on authors to highlight the science behind the structures. A key step in realising the vision for Acta Crystallographica Section E: Crystallographic Communications has been the development of the Research Communication article format, with new text sections designed to help authors bring out the science behind the structures and their determinations. These include Chemical context, Structural commentary, Supramolecular features, Database survey, Synthesis and crystallization and Refinement. Authors and readers will be pleased to find figures included in the published Research Communications rather than being confined to the supporting information. For the first time in the journal, individual reports are not limited to single structure determinations. In fact, authors are encouraged to describe the structures of two or more related compounds in a Research Communication. These changes will make Acta E: Crystallographic Communications the natural home for structure determinations with interesting science to report. We look forward to receiving submissions in the new formats from authors old and new from July 1, 2014. Exemplar papers in the new formats will be online soon so keep an eye on the journal web pages. In time, we envisage Research Communications and Data Reports to be covered by the Science Citation Index and the Data Citation Index, respectively. Read the full Editorial at http://journals.iucr.org/e/issues/2014/07/00/me0544/index.html.